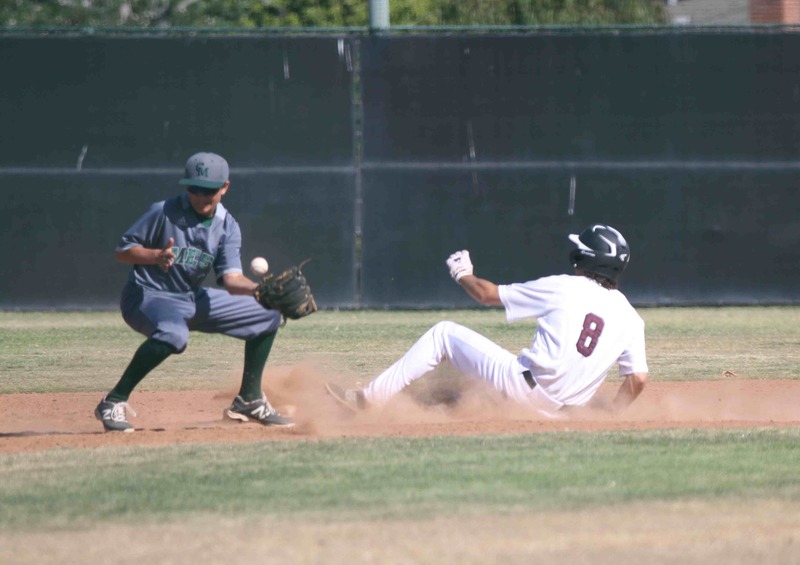 After losing their record streak to Godinez (4-5, 7-13), Laguna climbed back into the league lead as Ashton Goddard proved his Woodbridge shutout was no fluke by throwing a complete game, four-hit shutout of Calvary Chapel last Wednesday, April 20 at TeWinkle Park in Costa Mesa. Jack Simon, number 8 on the field. Goddard evened his record at 2-2, striking out seven. The hitting star was Dante Faicchio with two key doubles including the lead off hit that led to the initial Laguna score. Dante’s second double came in the third inning and again led to him scoring the Breaker’s second run. Laguna sealed the victory with a four run fifth inning including a two run-single by Conner Coscino, a sacrifice fly by Will Mcinerny and a double by Jack Loechner. Breakers will be tested in their final four games of the season in early May when they will face Estancia away on May 3 and home on May 6 followed by a two game series with Calvary for the title on May 10 and 12. In other games last week, the Breakers defeated Costa Mesa 9-6 at Mesa on Tuesday, April 19, and concluded their series with the Mustangs (6-15, 2-7) with a 15-5 win on Friday, April 22, at home to extend their win streak over Costa Mesa to 19 straight games dating back to 2010. Laguna holds a 58-58 series advantage.